Bottom Line: The Powmax Demon 580W has red LED's, red weave over the cables and red power connectors, a Bo-Sox fan can really get his fix. At less than $50 its inexpensive, but is it any good? 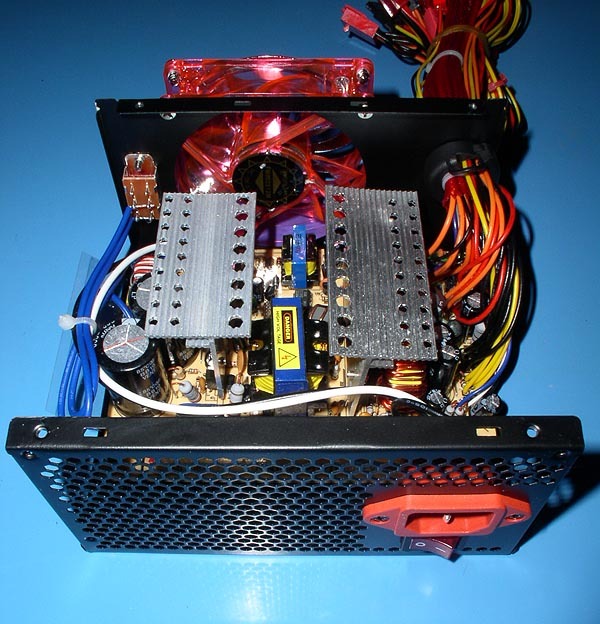 Powmax is a company typically associated with lower end power supplies. But when I had seen that they had a 580W model with a "black chrome" finish and red LED's for around $50, I had to check it out. The Powmax Demon is a bit of a backwards design. The back of the housing is perforated. There's a 80MM fan on the front of the power supply, inside of the case. Then there's a 120MM fan pointing down into the PC. Even the 110/230V switch is INSIDE the case!